In October of 2005, I began training to run my hometown marathon: The Los Angeles Marathon. Though I did not have a natural talent for the sport, I had always been a fan of distance running. Growing up, I admired Joan Benoit and Mary Decker. In the summer of 1984, I got my braces off and watched from home in amazement as Joan Benoit won the first ever women’s Olympic gold medal in the marathon. About a week later I was in the stands at the Coliseum to see Mary Decker face off in the now legendary women’s 3,000 meter final against 17-year old South African Zola Budd. It took another twenty-one years and the worst year of my life to finally get me to show up to my first group training run with the Los Angeles Roadrunners. Five months of grueling training later, I crossed the finish line of my first marathon in 6:01:04. I still remember the strange mix of excitement, fatigue and adrenaline as I crossed the finish line in downtown Los Angeles. I knew then it was the most transformative experience of my life but what I didn’t know was that it was the first day in the next chapter of my life. My second time around with the Los Angeles Marathon was a completely different experience. It was also my sophomore effort at obtaining a job as part of the media relations staff. Perhaps because I had made the 26.2 mile journey myself, I was better suited for the position and this time I was I was awarded the post. My job would be to find and field produce inspiring stories for NBC and Telemundo. It was a busy season for me since I became a Pace Leader for the Run/Walk group I had trained with the year before. Pace Leading required serious commitment. It also brought with it unexpected challenges. One of my weekly travails was the intersection of our 40-person group with the 3-hour pace group at the top of the ramp that lead down to the Santa Monica Pier. The 3-hour group included a blind runner named Adrian Broca who had run a sub-3-hour time in 2006. Every Saturday like clock work, Group 1 came flying around the corner like horses onto the downhill just as our expansive group was reaching the top. With their speed and our size it seemed impossible to yield to one another. Week after week we had a replay of Adrian and his guide, who ran holding onto a tether, having to stop on a dime or swing wide to avoid us. One week it was me who came within inches of knocking Adrian to the ground. His guide Jacobo shot me the evil eye as he quickly used the tether to pull Adrian to safety. In mid-January media efforts for the race accelerated. 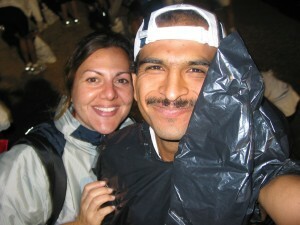 Amongst other stories, I was assigned a Spanish language preview story on blind runner, Adrian Broca. To be perfectly honest I didn’t think much of it at the time. He was a hometown hero and a great story. I put in my call to him and days later we agreed to shoot with the Telemundo crew on the following Saturday at Roadrunners training. It was not love at first sight. We had after all “seen” one another many times at Roadrunners. I thought he had a beautiful smile but I was not looking to date someone who was still in school, a few years younger than me and let’s be honest – blind. Adrian had lost his vision as an 18-year old. The reporter referenced beautiful sunsets and snow capped mountain ranges. Images many of us might take for granted on a daily basis. Adrian’s response to the question was, “My blindness is not my prison. Living in regret is a prison.” This statement, powerful and profound amazed and intrigued me. Early the next morning, the camera crew from Telemundo followed Adrian up and down the Venice beach strand shooting B-roll for the story. I sat on a bench with reporter Azucena Gomez having girl talk about marriage and relationships. Azucena was full of wisdom and shared her belief that for a relationship to work, both partners need to match one another’s steps. Neither one can be too far ahead or too far behind the other. I smile now at the irony that I was having this conversation as Adrian was just yards away. In the next few weeks as we edited his story, shot another bridge in Griffith Park and finalized details in the reporter’s narration, Adrian and I got to know one another. We had chemistry and we also had a number of things in common. We were both first generation Mexican-American and spoke Spanish. We both loved animals and a crooked road had led us both to running marathons. Race weekend eventually came around. I spent the few days leading up to it working long hours with Telemundo at the race expo. On race day, I field produced stories, including one with Adrian, live from the start line then jumped into the corral with my running group. It all seemed like a good idea until about Mile 16 when I hit the wall. I managed to finish but the last nine miles were absolutely brutal. Back in the hotel room I discovered that Adrian had left me a very thoughtful post race message. I knew he had been out on the course being followed by not only Telemundo but also by Patrick Healy and the NBC crew. When I called him back, Adrian didn’t mention anything about his pace or the television crews following him as he ran. He asked about my run and made me feel great about my 6-hour finish. We also made the discovery that we both vomited after races. I had actually been waiting for a thoughtful call from someone else but he waited a couple days and sent an email. It was probably too late anyway because Adrian was already fast becoming the champion of my heart. In both life and love, just as it is in running. Timing is everything.